It took skill and practice to scout, hunt and secure your trophy. Now you have a piece of taxidermy to hang and treasure for the rest of your life—or for a much shorter time if you don’t take care of your taxidermy mount. Your trophy requires care in order to survive in the long term without fading, discoloration, rips and tears. Experts recommend keeping your taxidermy mount in a dry spot that’s out of direct sunlight. This is organic material, and the hide as well as the nose and lips are apt to fade if the room is not temperature-controlled. That said, displaying your taxidermy mount too close to a fireplace or other heat source can dry it out too much. Find a middle ground for your taxidermy mount. The oils from your skin can also affect your mounts, so paws off. Touch your taxidermy mount gently only with microfiber cloths and feather dusters to keep them clean. Going over them with a soft-bristled brush can help keep their coats fresh, too. 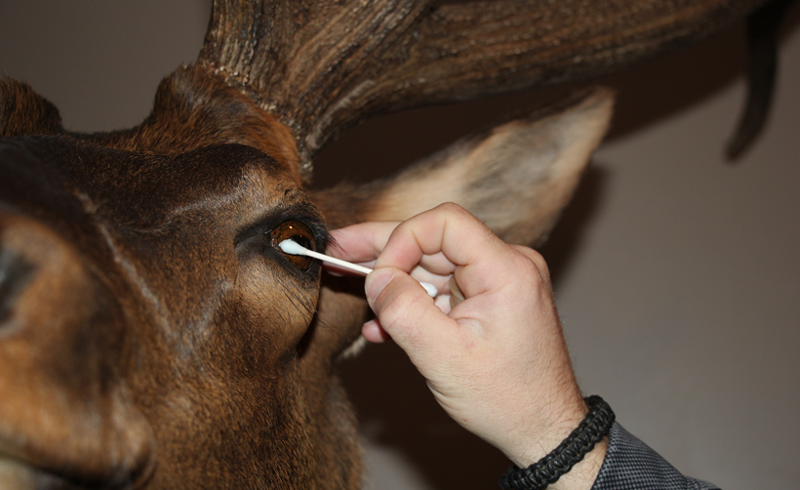 A moist cloth is suitable for tackling antlers, and cotton swabs dipped in glass cleaner are perfect for keeping eyes and noses clean. For birds, experts recommend avoiding water, which tends to matte feathers, and instead lightly wetting a rag with lacquer thinner, which evaporates from feathers quickly. Keep your trophies where pets can’t get to them and away from parts of the house where children play, if possible. Repairs to taxidermy are possible, but they’re costly. Sometimes, a piece will be beyond repair. Taxidermists recommend handling a mount as you would a piece of original artwork, which also has a story attached to it and can never quite be replaced. 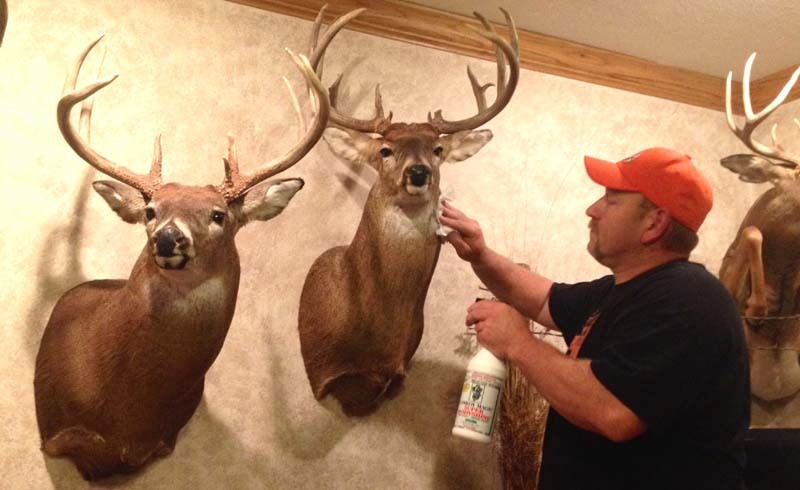 Ask your taxidermist if they used a protective coating on your mounts. If not, take them in and ask for a product called Body Shine, which protects the hide from dust and retains its shine.